In July 2018, Illinois legislators amended the bonding requirements for money transmitters in the state. House Bill 4805 was signed into law as Public Act 100-0640, which changes Section 30 of the Illinois Transmitters of Money Act. The main change that is introduced is a reduction of the minimum amount of the Illinois money transmitter bond that licensed professionals have to obtain. The new bill also alters the way the bond amount is determined. Below are the important details about the legal changes that Illinois money transmitters should keep in mind. 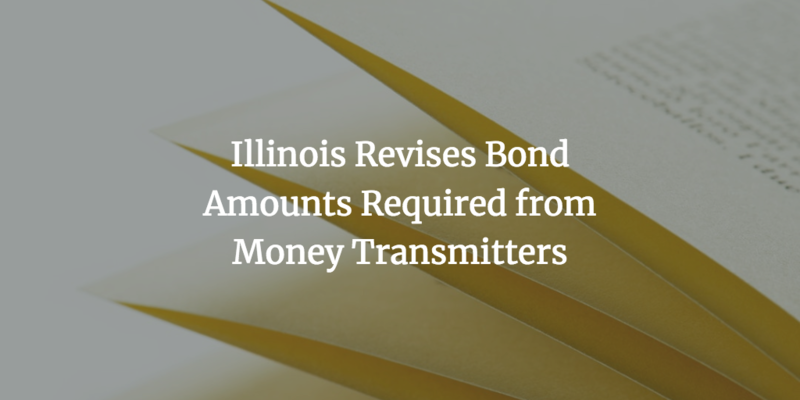 Similarly to most states, Illinois imposes a surety bond requirement for money transmitters. If you want to get a state license from the Department of Financial and Professional Regulation which oversees this trade, you have to obtain the necessary bonding. It is an obligatory prerequisite before you are legally allowed to conduct your activities. Previously, money transmitters had to get a bond equal to $100,000 or to the daily average of outstanding payment instruments for the previous 12 months (or for the whole operational history), whichever is greater. The maximum bond amount required could not exceed $2 million. The new bill reduces the bond to the greater amount between $50,000, or 1% of the transmitter’s activity in the state. The maximum bond amount remains the same. As before, if the required bond amount is above $1 million, the money transmitter can post a bond for $1 million, as well as a dollar for dollar increase of the net worth up to a total of $2 million. The changes don’t affect the length of the bond coverage as well. Money transmitters have to keep the bond active for five years after stopping activities in the state. The reduction in the minimum surety bond amount is certainly good news for Illinois money transmitters. If your activity in the state is rather minimal still, you can benefit from obtaining a $50,000 bond rather than having to post $100,000. Whatever the required amount is, it’s useful to know how your bond cost is formulated. In order to get bonded, you have to pay a small percentage of the bond amount, which is called the bond premium. It is often between 1% and 5% of the amount. How exactly is the bond premium determined, though? It depends on your personal and business finances. The stronger they are, the smaller the perceived bonding risk for the surety is. To be more specific, the main factors that would shape your bond cost include your personal credit score and company financials. For larger bond amounts, you will have to provide your audited business financials. Additional criteria that may affect the cost include any assets, investments, and cash on hand that you can showcase. In the case of money transmitter bonds, sureties may also consider the type of currency that you are working with, as it can pose different levels of risk as well. How do you see the changes for money transmitters in Illinois? Please share your comments in the section below.